The conversation surrounding the Buffalo Bills offseason will be dominated, like many other franchises, by discussion of the quarterback position. Is Tyrod Taylor the answer at quarterback for 2018? Do they make a splash signing at the position? Despite their questions at arguably the league’s most important position, the Bills do have several other needs they should look to address, including adding depth along several spots across the defense. 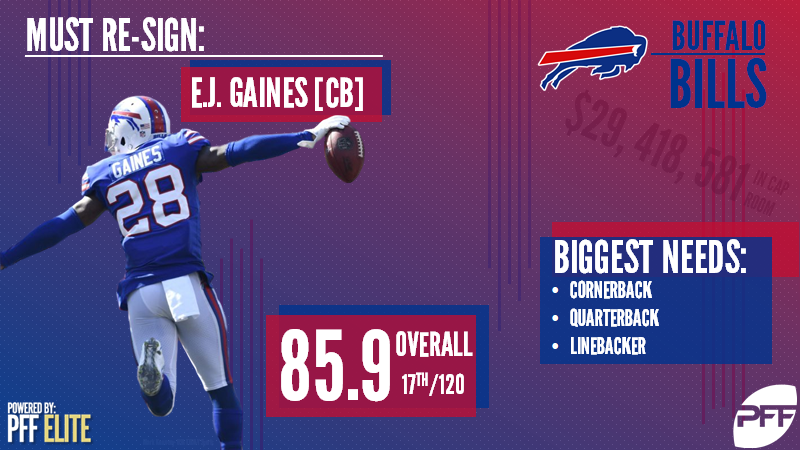 Gaines joined the team prior to Week 1 after a trade from the Los Angeles Rams, and all he did in 2017 was finish as the 13th-highest-graded cornerback in the league with an 86.6 overall grade. He played opposite of our Rookie of the Year Tre’Davious White all season long, and the duo formed one of the league’s top 1-2 combos at cornerback. At 26 years old, his asking price may be just right in a strong cornerback market this offseason, and by upping the anti to re-sign him to a long-term deal could ultimately prove a tall task for opposing AFC East quarterbacks to throw on for years. Lawrence broke out in 2017, finishing with a league-high 14.8 pass-rushing productivity rating among 4-3 defensive ends in Dallas. He brought in another 79 total QB pressures, also leading the league’s 4-3 DEs, choosing the perfect year for a breakout performance as his asking price should skyrocket with that kind of production. That being said, the Bills have lacked a bona fide pass-rushing edge threat opposite Jerry Hughes for some time, and if Lawrence’s 2017 season is no fluke, he would be a dream signing for any franchise in need of a force on the outside. Tate, Jordan Matthews and Deonte Thompson are all unrestricted free agents this offseason, so the hunt for a wide receiver to join Kelvin Benjamin and Zay Jones will be on. Landry would bring a bevy of targets, snaps and production to the Buffalo receiving corps, and an extremely viable option in the slot, where he is arguably his best. Landy in the slot would free up more 1-on-1 matchups for Benjamin outside and with their ability to get separation, no matter who was throwing throw ball to them, they should find success. Callahan would provide the Bills with a valuable slot cornerback, if they are unable to bring back Leonard Johnson, as Callahan fielded the league’s ninth-lowest passer rating in slot coverage this season at 76.3. He allowed a reception on every 15.3 snaps when covering the slot, the third-best mark among slot cornerbacks, showing his ability to limit speedy, shiftier receivers. Overall, during his three years in the league, the former undrafted free agent from Rice has brought in two interceptions (both this past season) and 10 pass breakups while allowing just two touchdowns into his coverage all on 123 targeted passes. He would add a more-than-capable body in the Bills secondary opposite White and Gaines, if they bring him back.